So this weekend we made a lot of mess. 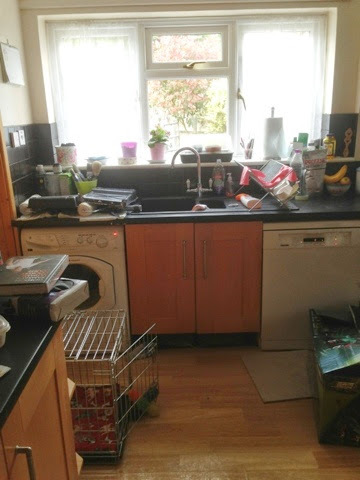 I now have no kitchen and I am surviving on mainly Tea and Takeaway. Sorry baby! 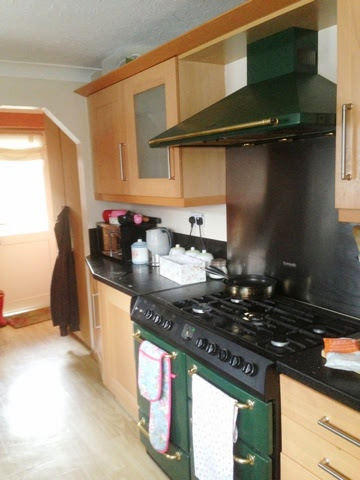 Here are the before pics of the kitchen. Excuse the mess! I was halfway through packing up when I decided I should probably take some before pictures for comparison. Nick and his dad did so much. They really worked hard. We were all pooped by the end of it! Ok, so here is what they did. 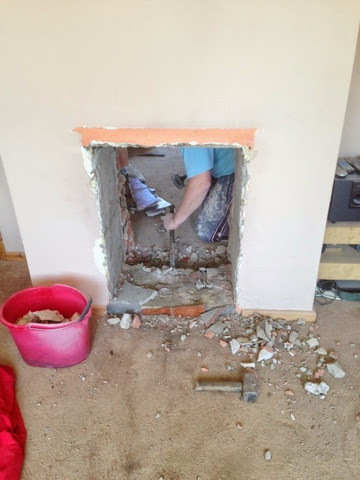 They knocked through the fireplace from our living room to our dining room so that we can install a double fronted wood burning stove that you will be able to access from both sides. 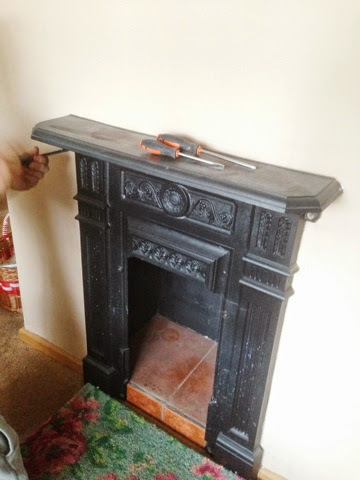 They took the board down that was blocking up the chimney and lots of soot fell down. We are taking this as a good sign! 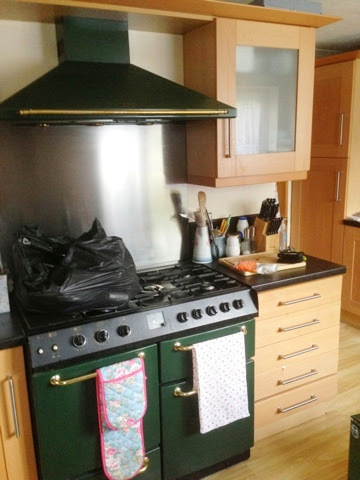 I have emailed a man to ask him to come out and see if our chimney needs to be lined, from the research I have done I believe that it will need to be so we just need to get some quotes for chimney lining and stove installation. 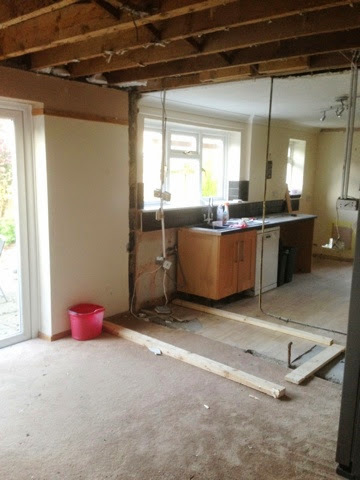 They took down the wall between the kitchen and the dining room. 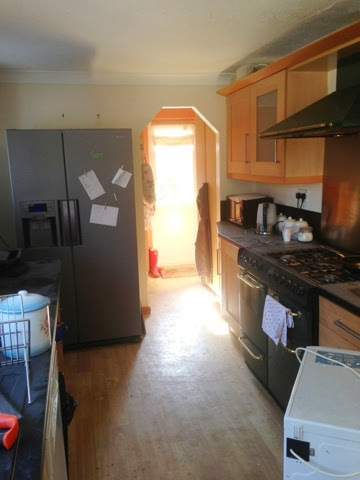 We bought a steel for this wall but it turned out we didn’t need it, so although I was abit peeved that we had wasted money on a steel we didn’t need it is better as it will mean we won’t need to have a beam in the room and the ceiling will be all one height through from the dining room to the kitchen. 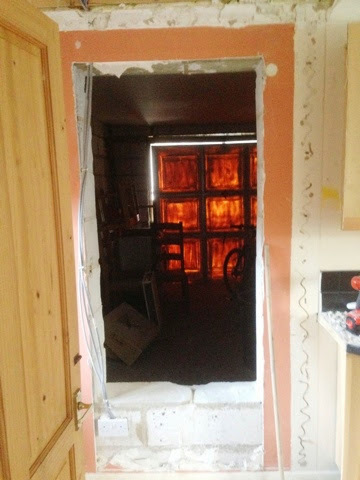 They also took down some of wall that was between the kitchen and back door. Its amazing the difference this has made. The whole space seems so much more open. 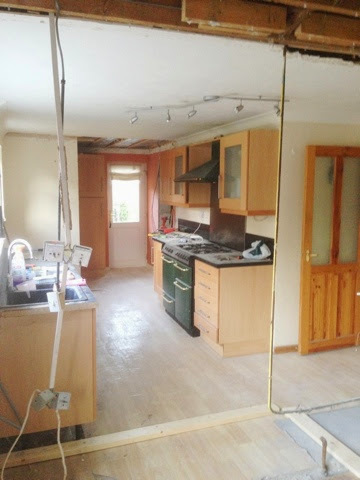 They took down the ceiling in the dining room and some of the kitchen. 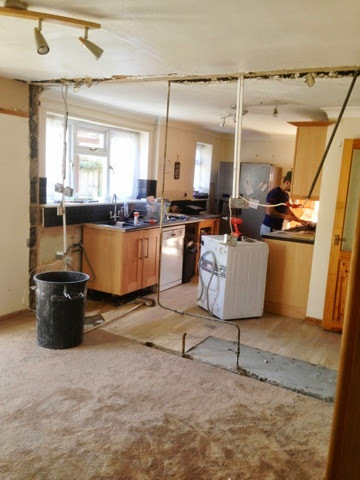 We are just waiting for the rest of the kitchen to be removed before we can take down the rest of the ceiling. Then Jamie the electrician can crack on and sort out the wiring for our spotlights and appliances. Waz the plumber will also be able to run the water/gas pipes where they need to go. This will make it much easier for them with no ceiling and means all the pipes and wires can be hidden. They have cut through to the back of our garage. 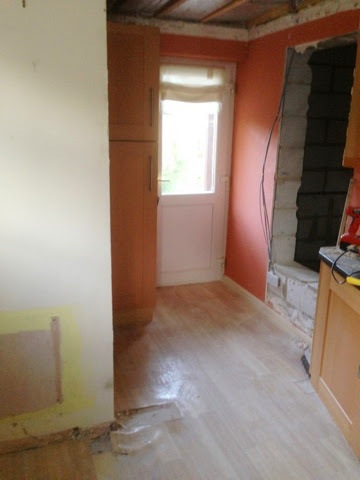 This will become our utility room. We couldn’t go all the way down as there is a gas pipe that needs to be moved first but it was good to get a taste of how the room will flow when it is all done. The whole space looks HUGE!! It’s so exciting. 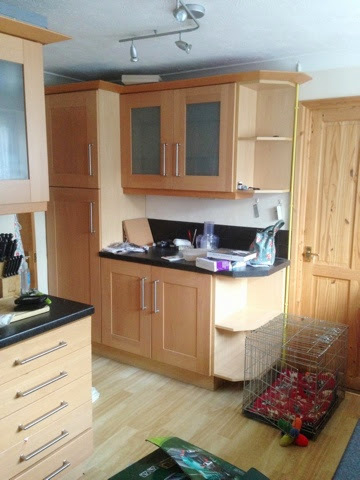 I cannot waitto get some kitchen designs drawn up. That’s the next job. Once we have thefinal plans Jamie and Waz can make sure we have all the wires and pipes we need, in the right place, and then maybe we can start thinking about putting the room all back together again.